Home » Competitions » Win one of 10 double tickets to the Flora Masterclass! Win one of 10 double tickets to the Flora Masterclass! You are invited to discover exciting new ways to create delicious plant-based recipes using Flora – just in time for a healthy festive season. Special guest Zintle Ntshikila will create, share and prepare her favourite plant-based recipes – and guests will be able to join in the preparation and meal creation. Three delicious dishes will provide you with the tools to enjoy a better-for-you holiday, the plant-based way. 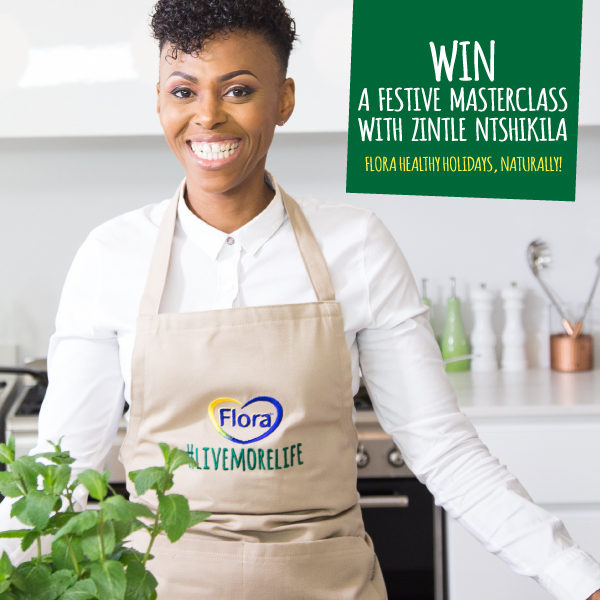 Join us, as we discover new ways to enjoy Flora, while preparing wonderful holiday recipes for the whole family, so everyone can #LIVEMORELIFE this festive season. To enter, simply complete the entry form below. Terms and conditions apply. Competition is for Joburg-residents only. Competition ends 5 December 2018.